Here's the latest addition to my crazy collection, a 1959 Singer Slant Needle 404. This model is a Slant-O-Matic with an internal gear drive, which makes incredibly nice, even stitches. It has a horizontal rotary hook with Class 66 drop-in bobbins, and accepts standard 15 x 1 needles. 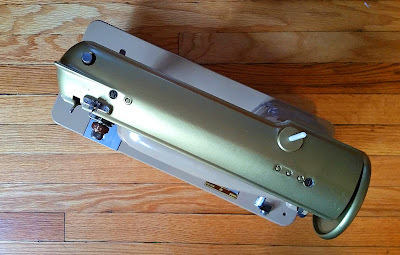 This machine has a funky "elevator" needle plate system with a lever that allows the needle plate to raise above the feed dogs for free-motion stitching or quilting, or raise all the way up to remove the stitch plate for cleaning. I've secretly always wanted a 400 series machine, but haven't run across one at a decent price. Also, it's not like I really NEED another sewing machine, right? Because honestly, at this point, I'm not really sure how many I have! This one though, this machine was free AND close to home. Very close to home—like right out the back door. Literally! My neighbor behind us in the alley tossed it out right before trash day! Fortunately, she works! And my husband offered to take the top cover and handwheel (which were originally a tan color on this model) and powder-coat them for me to cover up all the scrapes. 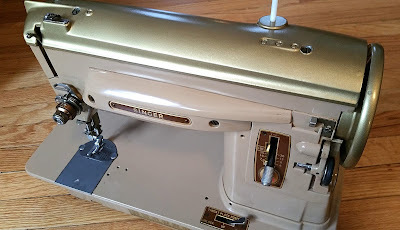 We picked out a gold color to go with all the gold trim on the machine. And he just took them out of the powder-coating oven last night, so I just now finished putting her all back together again. The gold color turned out okaaaaay, but in some light it can take on a big of a greenish tinge...like below. I think I would have gone with a different color had I known this gold was a bit on the green side, but what's done is done! After a little cleaning and a lot of oiling, this machine works great. A perfect machine for straight line sewing and piecing! Yay! I love her, what a great early Christmas gift! I think your machine looks great. The powder coating makes her look new. 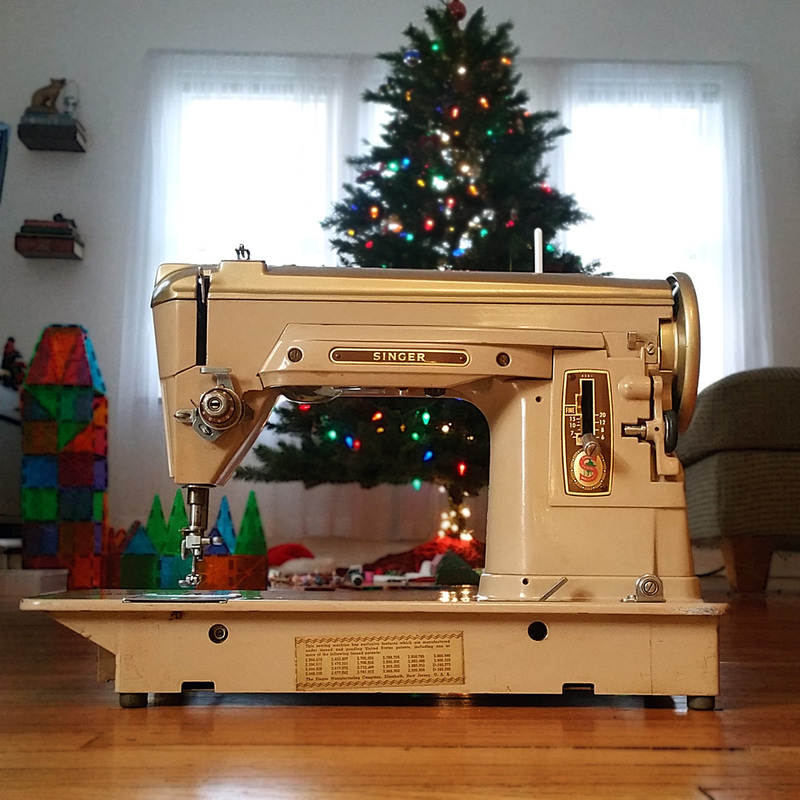 I have a 401 that I paid $10 for, and she is really fun to sew on. 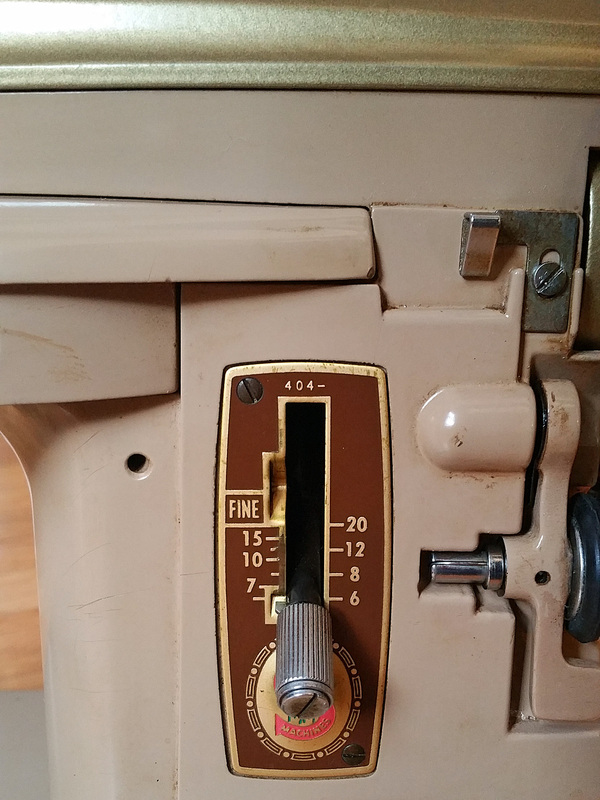 The 400 series machines have to be oiled on a very regular basis, like every time you sew to stay in good working order. I know you are going to enjoy your machine. Love my 403! Got it in a cabinet, $35, about 8 years ago! It has the cams for a bunch of stitches. I guess I should oil it up! I have many 301s. These slant machines are wonderful! Yea you on such a great save! I don't know what is better, the fact that you rescued her from the brink or that your hubby worked his magic on it--powder coating, what a great idea! I think that makes it look pretty amazing. I just got a 401A from the thrift store a few weeks ago & I am really impressed with the 400 series. Thanks for sharing pics of your new beauty! Thanks so much for stopping by Brenda, Deborahnhamilton, raebethriv, Material Girl and La Vonda C! So fun to see that many of you have a 400 Series machine, too! I can tell I am going to really love quilt piecing on this baby. Happy stitching! Congratulations on your find. I was just sewing on my 404 this morning, one of several slant shank ones I have. I love the sound these gear-driven machines make. Great stitches. Copyright Erika Mulvenna 2013 - 2017. Simple theme. Theme images by Ollustrator. Powered by Blogger.